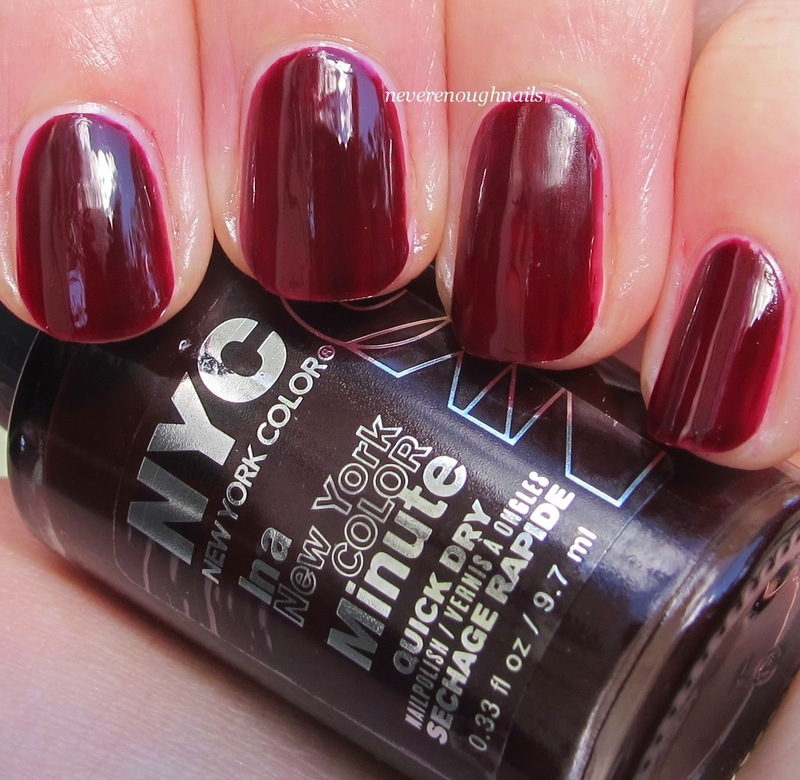 Never Enough Nails: NYC Halloween Goodies 2014 Swatches and Review! Today I have a bunch of goodies from the NYC Halloween 2014 collection to show you. Don't forget that you can win some of the treats shown here (and more) in my Trick or Treat Giveaway! 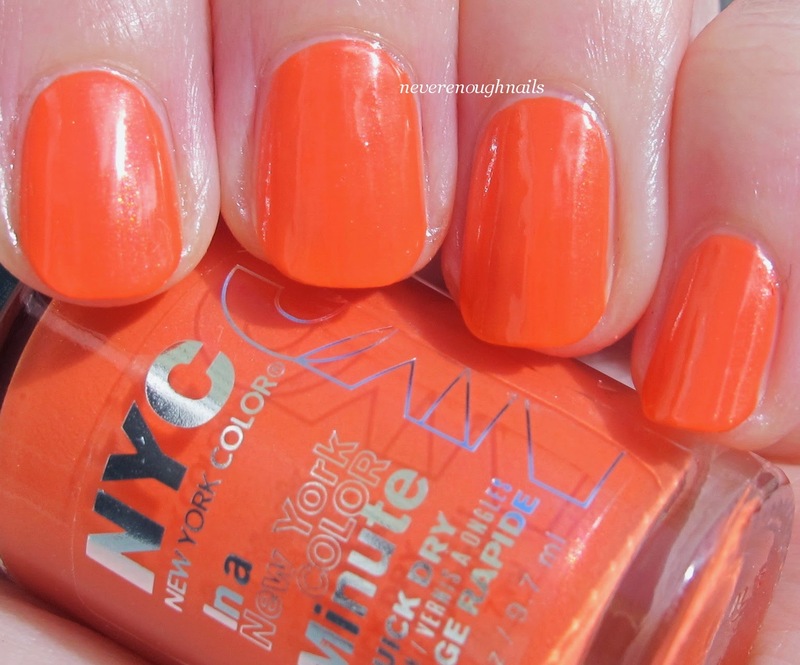 First up is NYC Animal Instincts, a peachy orange creme. Animal Instincts really has more of a pumpkin orange base, but then it has some hidden shimmer that looks pink to me, so it ends up with a peach appearance more than straight pumpkin orange. The shimmer is pretty subtle, but it adds dimension to the polish. I love this color! This is three coats of Animal Instincts. It was pretty much opaque at two coats, but it looked a little uneven, so I used a third to even it all out. It dries nice and fast, like the In a New York Color Minute line is supposed to. The formula is the perfect consistency, not too thick, but not too thin either. 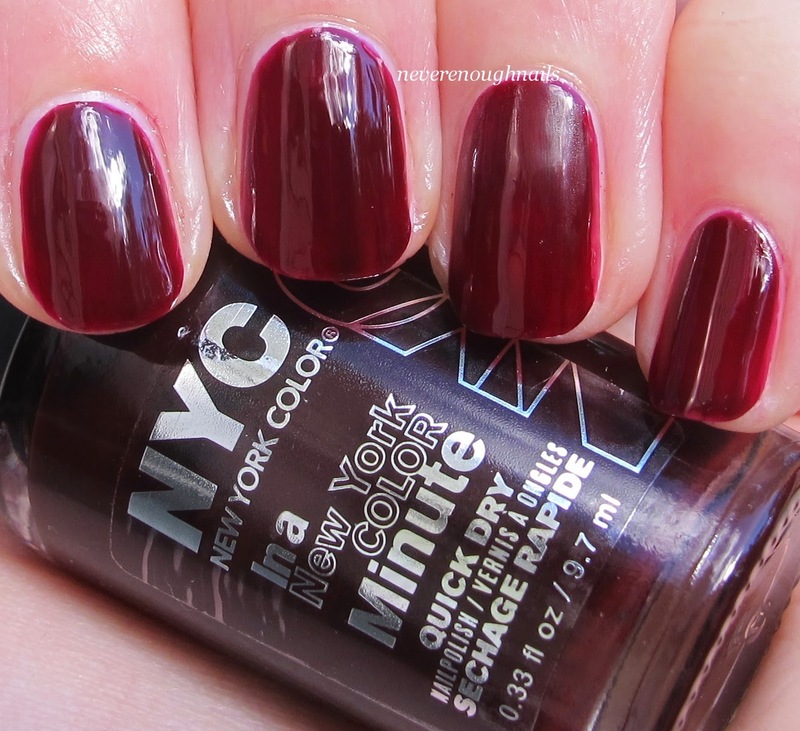 NYC I am Not AffRED was much cooler on the nails than in the bottle. In the bottle, it looks very murky and dark red, almost black. However on my nails, it became a vampy berry wine creme, almost jelly finish. It is too opaque to really be a jelly, but it has that squishy quality to it. I am Not AffRED is a great vampy, almost bloody looking polish. Perfect for Halloween. I think the name is supposed to be a play on "I am Not Afraid"... but afraid only has one "f", so maybe that second "f" is a typo LOL. This is three coats of I am Not AffRED. Like Animal Instinct, it was opaque in two, but needed some evening out. The formula was the same lovely consistency though, and was easy to apply. Hello new favorite eye shadow quad!!! 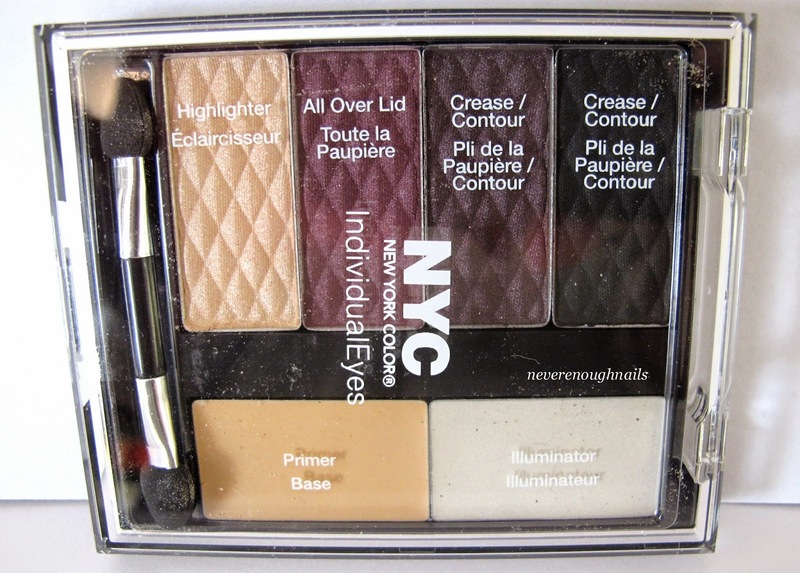 I love these NYC IndividualEyes palettes and have several now. They come with four eye shadows, a base/primer, and a highlighter. 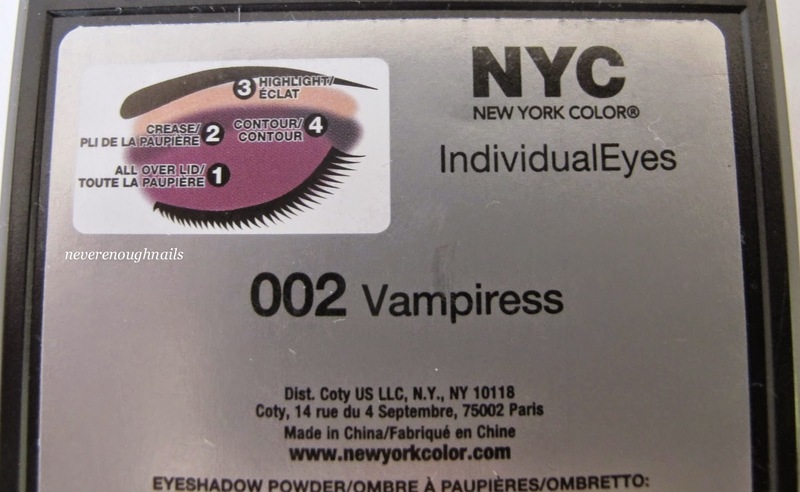 This one, Vampiress, has a lovely champagne shadow, a reddish purple, a darker taupe-y purple with some reddish shimmer, and a smooth pigmented black shadow. The highlighter is a creamy, silver-tinged white. 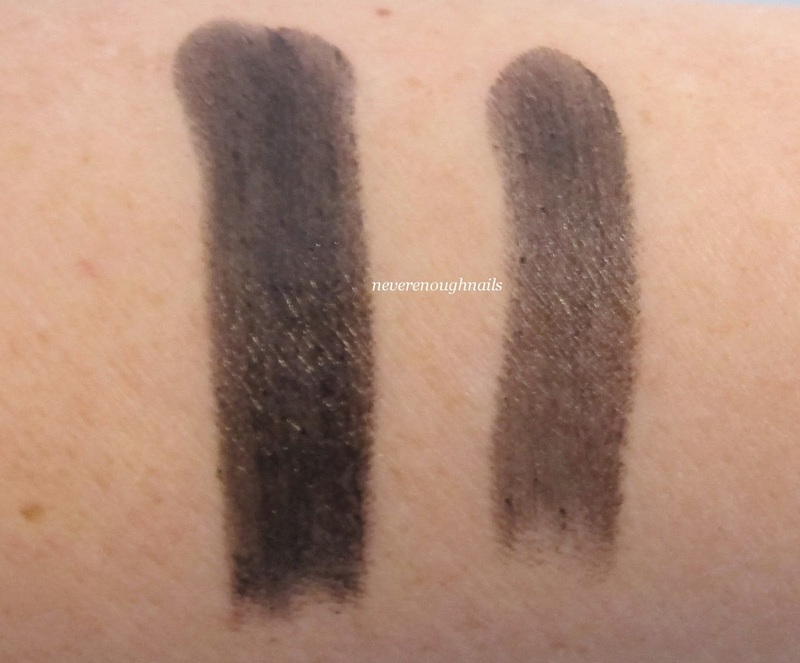 I find these NYC shadows to apply beautifully, they are buttery and smooth. 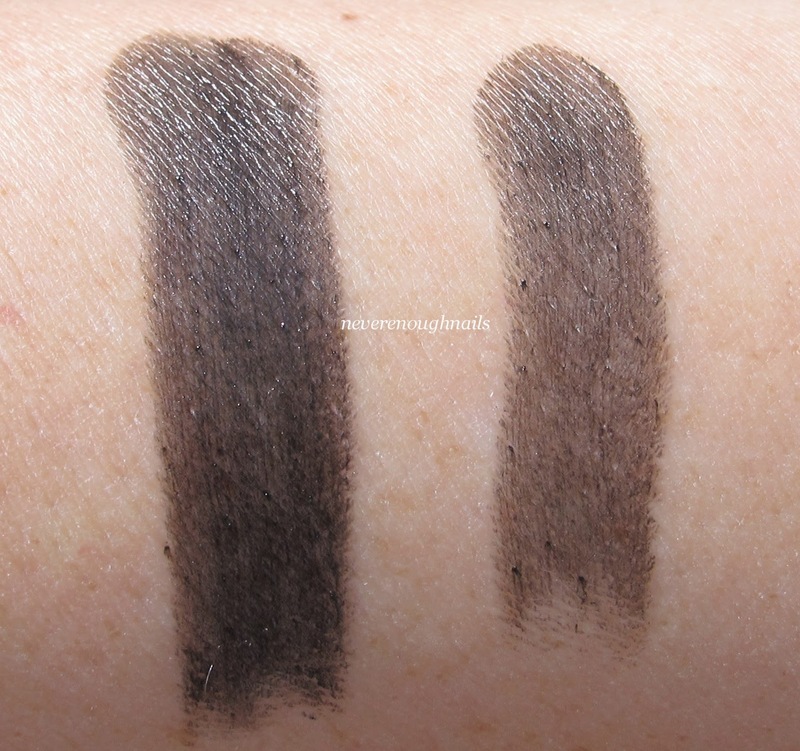 They are very pigmented when layered over the included base (as shown in my swatches). I applied these just with my finger. These shadows sometimes have a bit of fallout, but otherwise I find them to perform beautifully. They last all day when I wear them over my primer of choice, Urban Decay Anti-Aging Primer Potion. 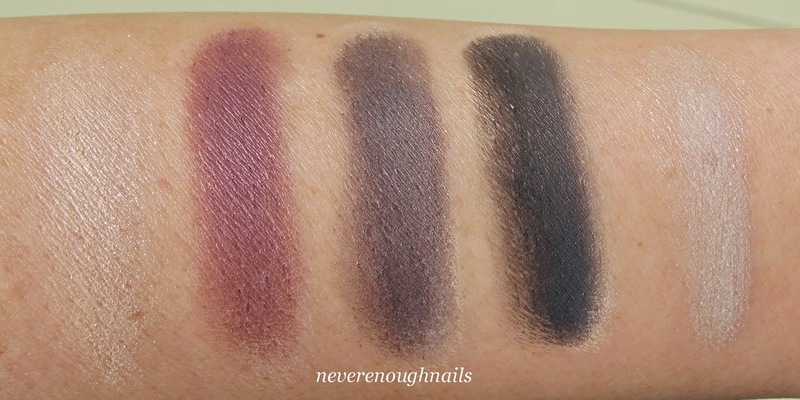 That purple-y taupe shade is my favorite! So gorgeous! I will get a ton of use out of this palette. 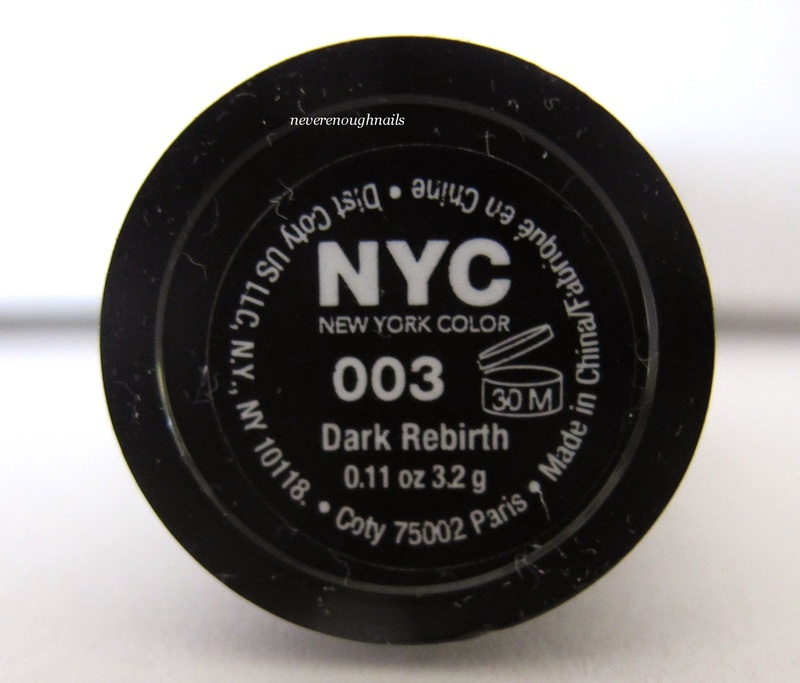 NYC Dark Rebirth is a great black lipstick for Halloween. 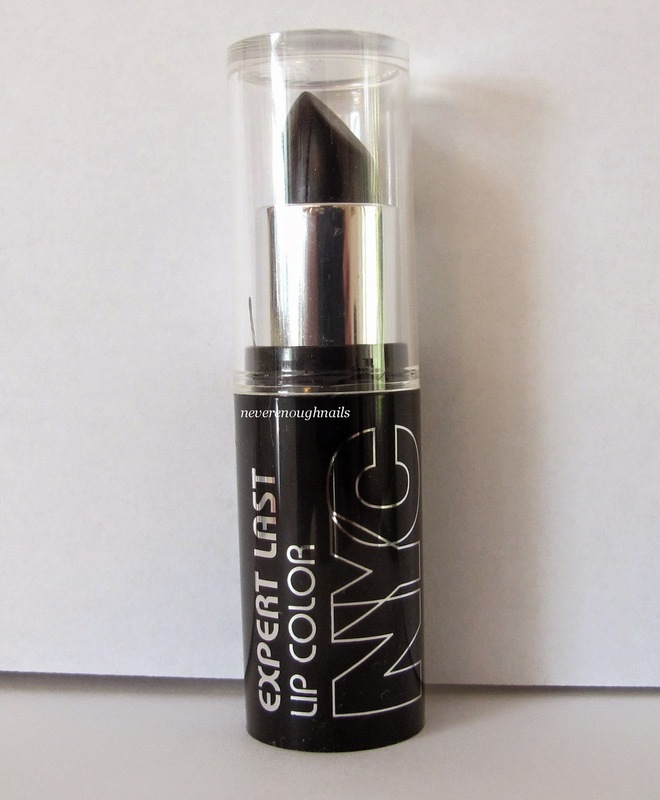 It's a deep creamy black and covers my medium pigmented lips nicely. Below I swatched it straight from the tube. On the left is 3 passes, on the right is one pass. I have a horrible cold right now and my lips are in bad shape, so no lip pics. I did try it on my lips and had to use a few passes to cover my lips evenly, but other than that it applied nicely. It goes on creamy, but dries to more of a satin finish. Overall, I love everything I got from the NYC Halloween collection. My favorites are Animal Instincts polish and Vampiress eye shadow palette. That palette is amazing, if you like make-up at all or even sometimes wear eye shadow, go get that palette! It rocks! NYC Halloween is available at a drugstore near you. Don't forget to enter my giveaway to win some of these items and other items from the collection! Me too Ananka, they're very nice!